Facilities Management is continuing with construction on the mid-campus green. The project was scheduled to be completed at the end of the Fall 2012 quarter. 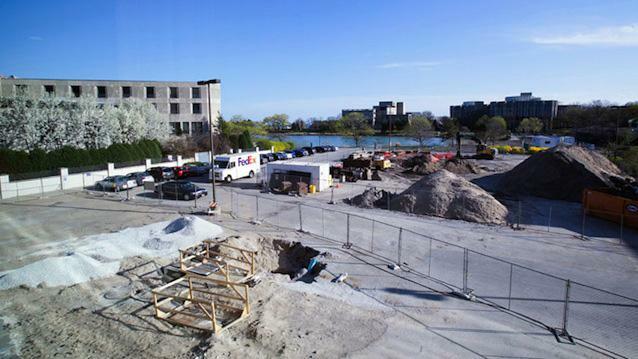 As the heart of winter approaches, Northwestern Facilities Management is pushing ahead with its many construction projects. Construction on the new Mid-Campus Green, a green space being installed adjacent to Annenberg Hall and the Allen Center is still underway after construction began in the summer. “We are wrapping up construction of the hardscape, which is the pavement and walkways,” said Bonnie Humphrey, director of design and construction for Facilities Management. Although construction will finish shortly, planting and landscaping will have to wait for warmer weather, Humphrey said. Facilities Management plans to install the landscaping this spring and will open the Mid-Campus Green in May. Weinberg junior Harlynn Siler said it felt like construction has been constant during her three years at NU. She said she would be excited if the Mid-Campus Green was finished by May. “A lot of our green space is just on the lake, and we have Deering Meadow, but you can’t really go wrong with having more grass around,” Siler said. Construction is also continuing on the new Music and Communications building on South Campus. The five-story, 155,000 square-foot structure will become a major asset for the Bienen School of Music and the School of Communication. The new building will house classrooms, offices, lounges, rehearsal space and a 400-seat recital hall. Humphrey said the first-floor framing and structure of the building is completed and work on the second floor is ongoing. Current plans call for the project to be completed in the spring of 2015. Those interested in tracking the construction can view a live camera feed of the building on the Facilities Management website. Announced by the University last February, the new visitor’s center will begin construction next week. Estimated to cost $32 million, the center will be a new place for admissions visitors to learn about NU, replacing the smaller current location at 1801 Hinman Ave. In addition to its current projects, Facilities Management is moving ahead with an addition to the Technological Institute. Two other renovation projects were completed at Tech last quarter. The project began in the summer of 2010 to meet the growing needs of the Weinberg and McCormick schools. The construction to Tech this quarter will take the form of infills, or additions to current structures. The first addition is a six-story, 50,000 square-foot structure, while the second addition measures approximately 49,000 square feet. The third infill project is scheduled to begin this spring. The infills to Tech put the facility at more than 800,000 square feet of space, making it one of the largest academic buildings in the world, according to Facilities Management. Weinberg senior James Lee said the continual construction can be annoying but is a good investment. “All this construction is not aesthetically pleasing now, but the administration is doing a good job taking student input about how our campus should look and doing the right thing for the future,” he said. As the fluctuating winter weather poses a threat to the construction projects and their completion targets, Facilities Management remains optimistic and is continuing the construction around the campus. “Our contractors do take special precautions in regards to the cold weather, but construction will continue throughout the winter,” Humphrey said.